How to overcome the obstacles of deploying a gun in a vehicle. Effectively drawing a concealed handgun while seated in a vehicle is a real challenge because of all the inherent obstacles, but it's a skill people should master because of how much time we spend driving. For many of us, we spend much of our lives driving. It then follows we have a higher probability of being assaulted while getting into, out of or while within a vehicle. It also follows that we should then practice using our handguns in this venue and also should make every effort to avoid being at the top of the victim selection process. Unfortunately, practicing using a handgun in a vehicle is difficult for most folks, as only a few ranges allow drawing and movement--let alone attempting to replicate your body movements when entering, exiting or operating a motor vehicle. Doing so even for practice can be dangerous to yourself and anyone else present. For instance, while seated behind the wheel doing a right-handed, strong-side draw, you can easily have the gun muzzle track across your legs and an arm. "Stubbing" the gun muzzle in the steering wheel or against steering-column levers is also easy to do. And this assumes you have managed not to entangle hand, arm and handgun in the seat belt and have avoided any drinks in the center-console cup holders. The only safe way to practice this is with a dedicated, non-firing gun such as a blue gun. There is no second method if you absolutely want to prevent an accidental discharge. Next you'll need a location that assures privacy. Now, review your normal routine for getting into and out of the vehicle, putting on your seat belt, putting the vehicle in gear and so forth--without doing any gun work. 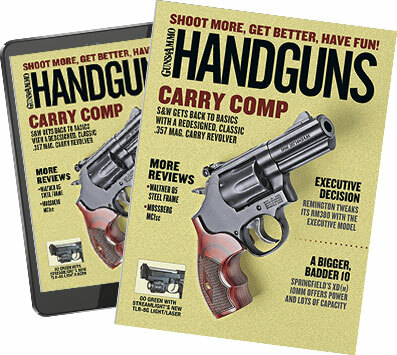 Once you've identified the typical actions and motions involved in driving, put on your holster and pick up the blue gun or other facsimile and practice deploying the gun during any of these actions. As you do the above, you might well find that the vehicle's safety features work against your safety. Today's seat belt is pretty good at protecting you, as is a contoured or bucket seat, which decreases sideways slippage of your body during a skid. Automatic door locks help keep doors shut, and the omnipresent cup holders decrease the possibility of hot spills or reaching for drink containers to keep them from spilling--possibly causing you to lose control of the vehicle. Once surrounded by all these safety features, however, drawing and directing a concealed handgun at a threat can be problematic. Like them or not, we are now strongly "encouraged" to wear our seat belts at all times, which most of us do--donning them on entry and not releasing them until we exit. (Fortunately, the automatically encircling seat belts of a few years ago are no longer being installed.) And most doors on newer vehicles lock automatically when the transmission is taken out of Park and unlock when put back in Park. I don't know about you, but there are times when certain locations and people raise my level of concern, and if I were to have to draw my handgun while in the vehicle with the engine running, the reflexive forward move needed to allow me to access my handgun will be abruptly (and possibly painfully) halted when the seat belt will not extend, having locked into position. Seat belts can't be disconnected, so early release is the only option, but check your state's seat belt laws. In mine, mandatory seat belt wear is not applicable in private parking lots. However, I can't get an answer to this question: "Am I in compliance with the seat belt law if I only wear the lap belt?" Also, I most certainly want my doors locked when I park in "iffy" locations, wanting to take one last look around before committing to leave the relative safety of my vehicle. I suggest habituating yourself to manually locking your door as soon as you get in and before you get out. And be sure to take a look around before actually getting out of your vehicle. A threat may pass you by if he thinks you're not an easy mark, but sometimes you are the only item on the menu. Contrary to popular wisdom, predators are not dumb, and they know how these safety devices and convenience features work against you, and they may well elect to attack when you are most disadvantaged, such as when you are in the process of getting behind the wheel or exiting the vehicle. Certainly, all your limbs are tasked during these actions, and with the proliferation of the ubiquitous portable communication devices, you're also probably not paying much attention. Most bad guys know this, and they may have successfully attacked people in the past using tactics targeted at points in the driving process such as I just mentioned. So they will be prepared. That's why both preventative measures such as awareness, along with handgun skills, are equally important. A threat may pass you by if he thinks you're not an easy mark, but sometimes you are the only item on the menu. The least you can do is give him indigestion.